Hello and welcome to the latest installment of the ‘Watch’ series. Poo Watch, we have found, is very similar to Cot Watch only smellier, more messy and a lot less fun. Where Cot Watch stole from you precious hours of sleep, Poo Watch will take away all aspects of dignity and self respect as you come to accept that walking around your home, garden or your local Co-op with a little bit of someone else’s poo about your person somewhere will become completely acceptable. Give me the sleep deprivation any day. 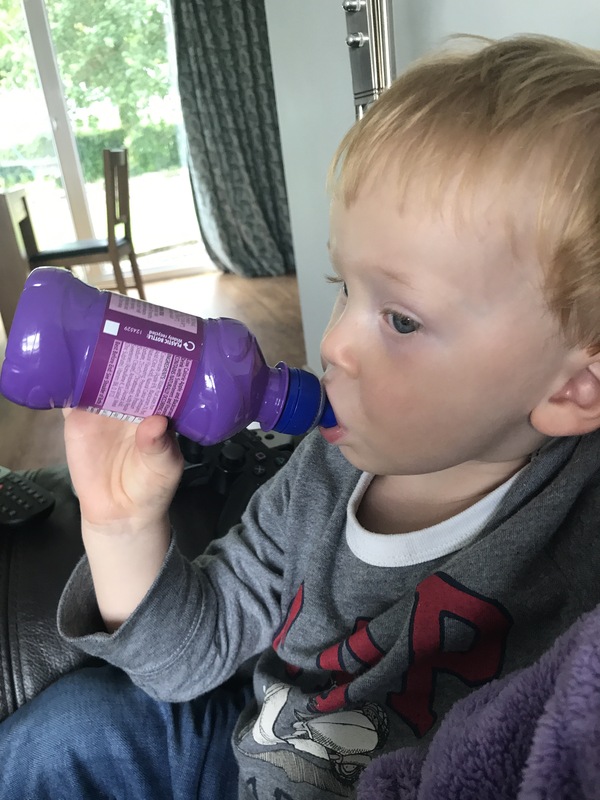 My little man – currently battling a Fruit Shoot addiction. Is this how you do it, Mum? Pants, pants, pants and pants. And patience – lots of patience. Day one of Poo Watch started like any other day. My snoozing Dude woke me at 7am by pulling at my face, declaring that he is not a vampire and asking for a Fruit Shoot. 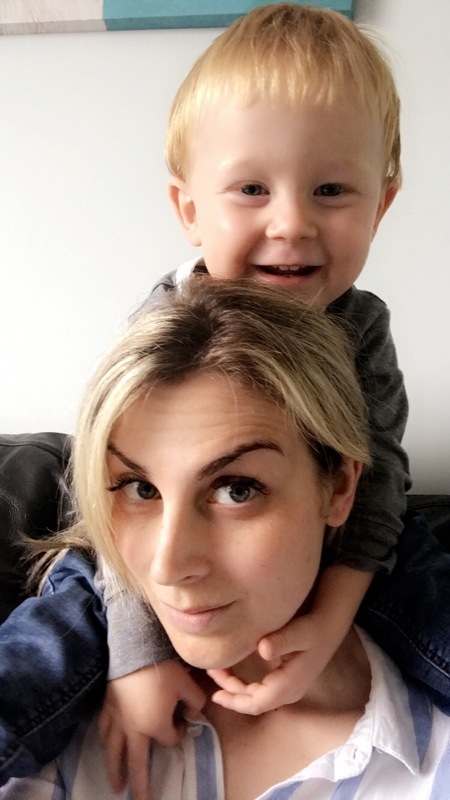 Bearing in mind that he had already necked a Fruit Shoot at 3am in the morning, I politely declined – a decision that clearly went down like a sh*t filled nappy because I promptly received a smack around the chops. A short wrestle later and he was placed on the potty peeing! After placing the Dude in his first pair of ‘big boy’ pants, we were headed downstairs for breakfast. Okay, so not the answer I was hoping for but it was a rather long sentence for a two year old to answer. I refused him the Fruit Shoot, stepped over the tantrum that was playing out on the floor and continued to make the porridge. Whilst he was down there, I figured it wouldn’t harm the situation if I asked him if he needed a wee. He kicked me. Just having a poo, Mum. Don’t watch! I’m back with clean hands and with the Dude in a clean nappy. Yes, I said nappy. Potty training is done for the day. Where were we? Ah, yes…breakfast was running smoothly and by smoothly I mean that I made both children porridge and within minutes the porridge had been discarded and both children were now asking for crisps and sweets. They settled with my compromise of a banana each because ‘no child should eat sweets at 8am’ and as I stated this nutritious fact, I spied an open bag of Boost mini-bites in the fridge and grabbed a couple (four) because it was going to be a long day. After breakfast, I noted that my boy had been in his pants for almost an hour and that needed to be praised. As a two year old, he has no sense of time and celebrated his milestone by subsequently urinating down his leg. Grabbing his potty (that was literally right next to him), I already knew it was too late and a puddle had formed around his skinny little legs and was now heading towards the brand new Sky Q box that contained a brand new episode of ‘Game of Thrones’. It was a tough decision to make in the heat of the moment but you will be pleased to know that, unlike my son, the Sky box remained dry. I brought down the second pair of pants. It turns out that Superheroes do wee their pants. A lot. Who knew that Captain America, Iron Man and Spider-Man could be so wet? I have my nieces for the afternoon. Do you want a playdate? Soft play was decided upon and out came the pull-ups because no one wants to be the parent of the kid who leaves brown stains down the winding snake slide. In a crap (these puns are just running out of me like…) attempt to be consistent, I kept up to my pretence at potty training with half-arsed ‘do you need a poo or a wee?’ questions whilst sipping happily on my latte lying to myself that if your kid wears a pull-up then that basically means they’re potty trained because, you know, they can pull them up. Poo Watch, you’ll be pleased to know, continued into our second day of the school holidays. After achieving multiple pees in the potty and one poo, I declared day one a partial success. At poo watching, we were the best. The morning started positively when we celebrated the Dude’s morning wee in his potty with a high-five. 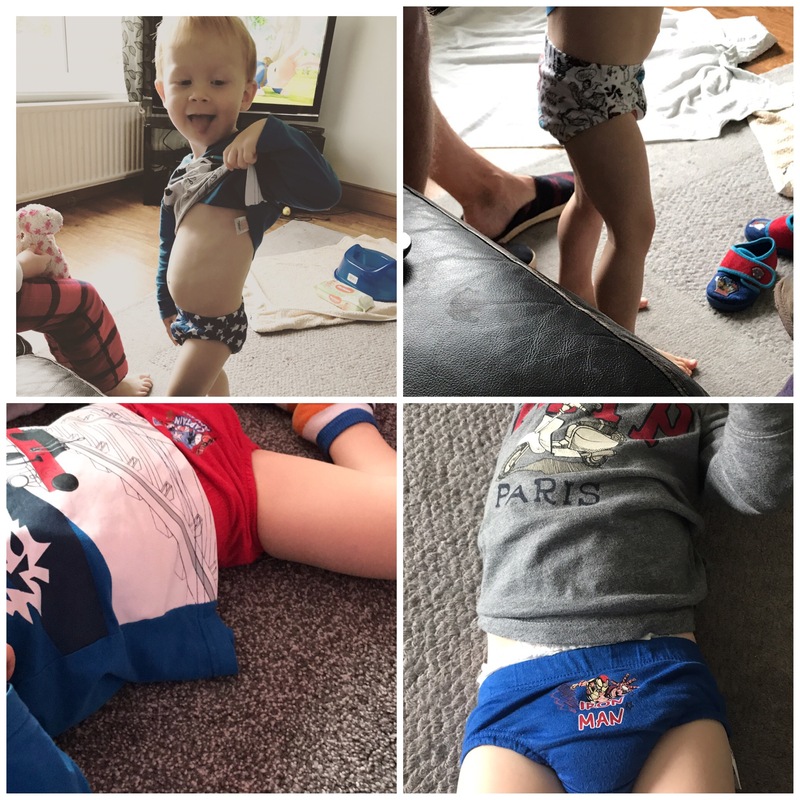 White star pants were placed over his diminutive derriere because he was our ‘little star’ for using his potty (there were no superhero ones clean and we were trying to be clever…). Off we went downstairs to breakfast. While eating his Weetabix, my boy pointed at the television. “That’s not a very nice thing to say about Topsy,” I said thinking he had just heard the word one too many times yesterday. When Daddy arrived downstairs, it became clear that I too had become desensitized to doo doo because he stuck his nose firmly in the air and declared that someone in the room had clearly let rip. Cursing myself because, by jove, the boy had got the hang of it, I grabbed the potty. “It’s too late,” Teaching Dad declared and asked me what I needed. I needed an extra pair of hands but instead, defeated, I asked for a pull-up. “Pull-up?” my boy asked before hitching his pants up a bit tighter around his bum and I could only watch in dismay as those white little pants started to take on another less pleasing colour. And that, you’ll be pleased to know, concludes tonight’s edition of Poo Watch because as I type these last few words, my name is being shouted repeatedly by Teaching Dad who is in the play room with our little Dude watching him curl out yet another poo. I’ll get the wipes; you grab the nappy. 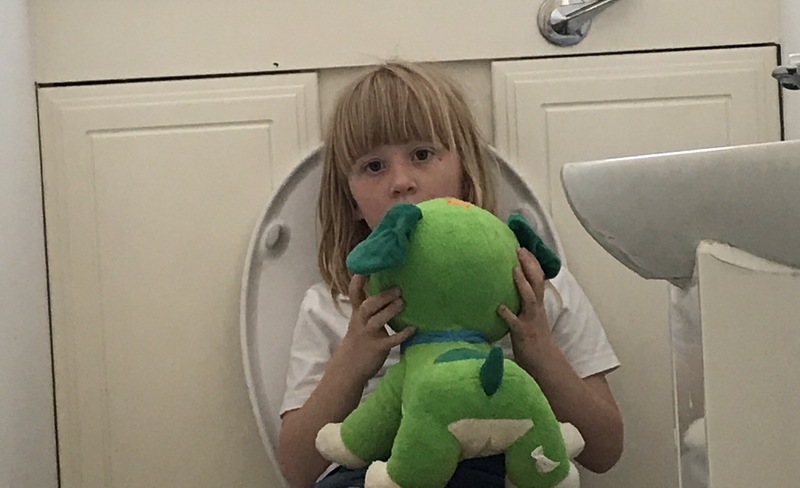 At least one of our kids knows how to use a toilet even if she has to take a teddy in there with her. Categories: Potty Training | Tags: nappy, potty, pottytraining | Permalink.